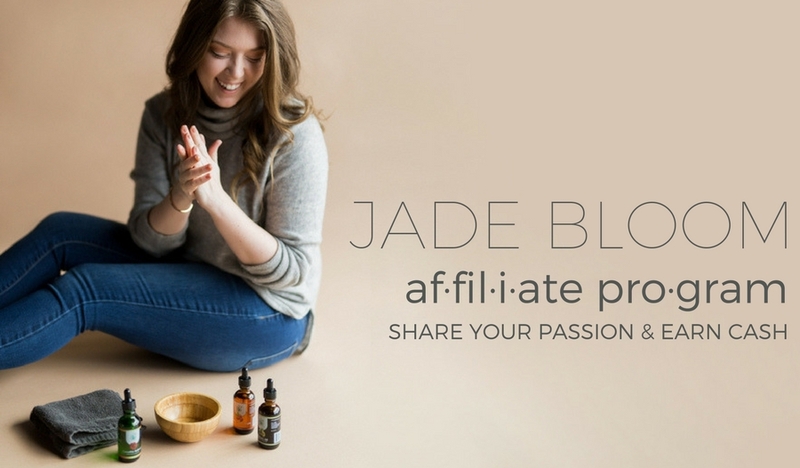 JADE BLOOM'S AFFILIATE PROGRAM JUST GOT A MAJOR UPGRADE! Help spread the word about the fastest growing essential oil company in the U.S. and get paid. Jade Bloom exists to change the way people think about their health, and this mission will only succeed with the help of our valued affiliate partners. Help others discover the healing benefits and healthy lifestyles that come from 100% pure essential oils and all-natural products. Earn lifetime commissions for both consumers and wholesale customers ie: Spas, Soap Makers, Candle Makers, Essential Oil Resellers, etc. Withdraw your money in cash or convert your commissions to store credit for personal orders. It is free to become an affiliate and easy to join. We have pre-designed graphics, banners, and links that make it easy for you to share the great news about Jade Bloom through social media like Facebook, Twitter, and Instagram and it doesn't require any technical knowledge. As our affiliate partner, you will generate traffic and sales for our website and receive generous commissions in return for helping people be healthier and happier. If you are not yet a member, click below to apply for free. We will confirm that you have personally sampled Jade Bloom's amazing product by placing at least one order. If you have not yet ordered from Jade Bloom, please do so before applying for the program to prevent unnecessary delays in approving your application. This policy is in place in the interest of ensuring that an affiliate is as informed as possible when promoting our products. We also encourage our affiliate partners to learn about our product line by enrolling for free at Jade Bloom University. We will give you $32 to spend and sample any of our products once you have completed the courses. When you join our affiliate program, you will be supplied with a range of banners and text links to place wherever you like. When a user clicks on one of your links, they will be brought to our website and their activities will be tracked by our affiliate program. Once this user completes a purchase, you earn commission! When you join our affiliate program, you will be supplied with a range of banners and text links to place wherever you like. You also have your own unique store URL that is completely customizable with the products you choose to display to your customers. When a user clicks on one of your links, they will be brought to our website and their activities will be tracked by our affiliate program. Once this user completes a purchase, you earn a commission! Jade Bloom's high-quality oils, low prices, and loyalty point program ensures that your referrals will return to Jade Bloom for all their essential oil needs, and each time they do, you get paid. Once you have referred a new customer account to Jade Bloom you will continue to earn commissions on that account for the life of that customer, whether or not they ever click on your tracking URL again. Build residual revenue while promoting Health, Healing & Happiness®. Log in anytime to check your performance of sales, traffic generated, and your commission balance. You can request a commission any time your balance exceeds $10. Withdrawal requests will be held if the affiliate hasn't made at least one purchase from Jade Bloom. Once you log in simply go to "My Account" and click on "Affiliates" in the left-hand column to manage your affiliate account. Welcome to the Jade Bloom Affiliate Network! Our Affiliate Network isn’t just a way to supplement your income and be compensated for referring others to Jade Bloom. Affiliates are who Jade Bloom turns to discuss upcoming products. Affiliates are a part of the Jade Bloom family, which is why we turn to YOU to solicit feedback on our corporate vision and are careful to consider and implement your suggestions. Now that you have signed up to be an Affiliate, you have access to the Affiliate Network Back Office. Simply log into your regular Jade Bloom account using the credentials you set up, and you’ll now see you have access to an “Affiliates” tab on your Account dashboard. It is here in this back office that you can keep track of your commissions, view your client’s orders on which you are receiving commissions, request a withdrawal of your commissions, view reports, and create links/widgets for your website. You now receive 15% commission on first-time orders from those you’ve referred. You’ll then receive 5% commission on all orders placed by that customer thereafter. You now have access to a unique Affiliate URL that you can share with friends and family. Sharing this Affiliate Link is 1 of 2 ways you can bring on new clients for which you will receive commissions for. Once someone you’ve referred clicks this link, it brings them to the Jade Bloom homepage and to explore the website. Once they set up an account, they’re then linked to you. Once they place their first order, you’ll see them reflected in your transaction/commission history in your back office. The second and best way to guarantee you’ll receive a commission for a referral’s orders is to add that referral’s email address to your Lifetime Customer list. This can be done by contacting Jade Bloom Support directly. Via email at [email protected] or via Live Chat on our website between 10 AM and 7 PM MST Monday through Friday. You will always have fast support with any question you have about our network. We’d love to chat with you and are happy to help! Thank you for joining us in our mission to change the way people think about health! Payout Requirements $10.00 - Minimum balance required for payout.